← Garden tools: Let’s get some power! It’s great motivation to do little things to increase my activity. By little things I mean take the stairs instead of the elevator and park at the back of the parking lot. It works wonderful with typical exercise like the treadmill, stepper, walking the dogs and biking to work. It doesn’t work well for vacuuming, cleaning the bathrooms or shopping. In those cases I need to manually (and mentally) tally if the effort counts toward a more active healthy life. Gardening activities, such as weeding, hoeing, digging, planting, spreading compost and trimming shrubs… not to mention dragging my wheelbarrow up the hill… expend lots of effort. I figure if I’m hot, sweaty, tired and muscle sore that I need more “credit” than my Fitbit gives me. This one is interesting because it compares your effort (the task you do) with what you eat. CalorieCount For example planting seedlings for an hour means you can have 4 glasses of wine. Gardening is fun, provides food and beauty, and it’s a great way to get physical activity. Physical activity that can help strengthen bones and joints, lower blood pressure and help manage stress. P.S. Here’s a video of Park Seed participating in National Exercise Day, which falls on June 6 every year. 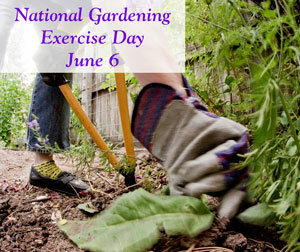 1 Response to Does gardening count as exercise? oh my god …. 4 glass of wine for an hour of planting seedlings? …..how did I not know know this?! Awesome! Thanks!